Are you intrigued by some of the art and how it is created? Maybe you have an idea of your own that you think you might like to try…. or perhaps you are just curious. 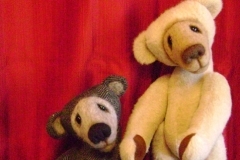 A needle felting class might be something you might like to try. Please check the schedule and the locations below and see if a class might work for you. We tend to have alot of fun in class and sometimes students see projects go in directions they never thought possible. Many of the students feel that they are not all that artistic, but no one said you had to be ….just come and enjoy learning needle felting and enjoy the camaraderie. Hope to see you soon!!! I am constantly adding new classes. Checkout my current list of classes below to see which of our classes interest you. This 2 day class will have a different theme each day. Day One will be working on facial features. Noses, eyes, cheeks, ears, etc. We will be making sample heads and then working on making their features and finessing our techniques. Day Two will be creating Gnomes, hopefully using some of the facial features that we perfected. I do not expect to make complicated bodies for these gnomes in our one day class, but sometimes simple is better. What more can I say? We will be trying to make owls – different types, of course, and using wire armature make them able to sit on branches or perches. We have not yet devoted a class to these birds of prey but I think it will push techniques to try and get them looking as natural as we want them. This is not to say that we have to follow Mother nature … if you think that a funky owl in different colors is appealing then I will be right behind you as always! To Register for classes at this location, you need to contact me directly – I will be keeping all the lists for the classes at this location contact me at Irene@ireneheckel.com or call me at 516-527-4633. Classes must be paid for in advance, check, cash or credit card (Visa/MC only). If for some reason you have paid for class and cannot attend, I will gladly move you to another class of your choice. Contact me if any questions or you need to make other payment arrangements and I will do what I can. 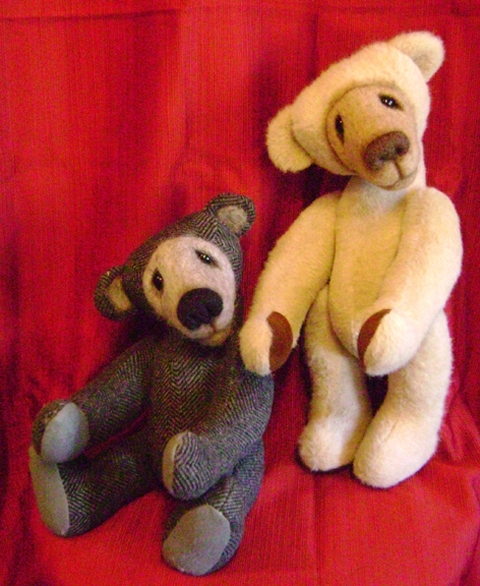 Learn to make a bear – this class we will be working on natural type bears – not teddy bears (that will come at a later time), so look up a few of the bears native to our area… or maybe something from your own imagination. Black bears are on everyone’s mind these days! But we are using them to refine techniques of creating bodies and sturdy legs to stand on. Sheep Class – some of a different color!! Making sheep with traditional colors and some using “imaginary colors” . Learning to use locks, and for the non beginner perhaps using some different supplies for legs…. Class is good for beginners and more advanced students too. “Stab & Gab” -While not a workshop or class it is a great way to get extra help to start or finish a project with fellow needle felters. At this location it is the 1st Friday of each month from 6pm – 8pm and the cost is $10. I know that I do not require registration for Stab & Gab, but if possible , please let myself or Mary Jo know if you can or can’t make it. I travel about 35 minutes to get there, and Mary Jo re-opens her store to let us use it for our session and there have been some Fridays that no one came. I would like to avoid the trip if this is the case and I am sure that Mary Jo would also appreciate it also. I love Stab & Gab, and this is not always the case, but I am asking that you please consider letting us know….thanks in advance for understanding!! To register for class , please call The Wool Room directly. I occasionally am invited to teach workshops at other locations or for special events. See below for details. Please register for this class directly with FENCE through their website. Here is the link to their calendar http://www.fence.org/calendar and the website has their contact info. Learning to needle felt a beautiful dogwood flower ( the NC state flower) Then transform it into a wearable piece of art that you created! Great class to learn needle felting techniques or perfect some of the techniques that you have learned. Learn to use fibers to “paint” a picture. We will be starting with a prefelt base (sheet of partially felted wool), a head shot of your cat or dog . Please enlarge your photo ahead of time to apprx 8 x 10…it will make it easier to use it as a reference. Then, using our fibers and needles we will try and recreate our pets in fiber (and of course use our creative license! ) I will need you to email a photo to me once you have registered for class (irene@ireneheckel.com) so I can try and bring the fibers necessary to recreate your pet (some may not be an exact match, but I will do my best. Any questions please email me and I will try and answer you. NEEDLE FELTING TROLLS, FAIRIES AND WIZARDS – OH MY! We will cover needle felting techniques to help develop a character doll face. The techniques will help build noses, cheeks, ears, eyes, etc., all with the goal of creating a unique character. We will also be constructing a basic wire armature and learning to create a body to complete our dollʼs character. If doll is completed, costuming or clothing will be addressed and can be started in class if time allows, or completed at home. If you are interested in this event, please go to the SEFFA/Fiber Forum website www.sefiberforum.org for more information on costs and registration.